Gangtok: Three days before P. S. Golay, the president of the Sikkim Krantikari Morcha, is due to be released from jail, the ruling Sikkim Democratic Front held a massive show of strength by organising an umbrella - the party's symbol -rally here on Tuesday. The rally started from the Guard's Ground and culminated in front of the SDF headquarters at Indira Bypass after covering a distance of about 6km via Zero Point and NH10. 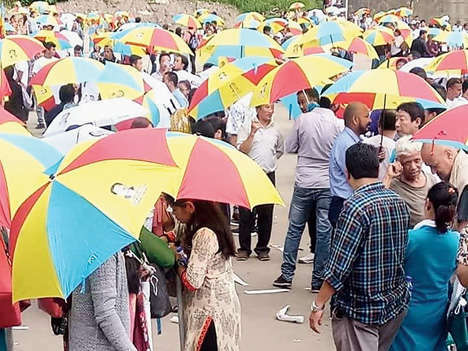 An estimated 6,000 SDF supporters marched along the route holding up their multi-coloured umbrellas in party hue of red, blue and yellow and shouting slogans hailing the party and its president and Sikkim chief minister Pawan Chamling. D. B. Thapa, the senior vice-president of SDF and party in-charge of East Sikkim, said the main intention of the rally was to stay connected with the people. "We have held similar rallies at Rhenock, Gnathong-Machong and Chuchachen Assembly constituencies in the past few days. The main intention of the rallies is to keep in touch with people since the SDF is the party of the Sikkimese people," he said. However, the timing of the rallies, coming as they have done on the eve of the release of Golay, who is a friend-turned-foe of Chamling, is being seen as a kind of psychological attack on the beleaguered SKM in political circles here. "In the one year Golay has been in prison, the SKM has been lying rather low. The party is hoping his release from jail would galvanise the party in the lead up to next year's Assembly elections. The SDF obviously doesn't want that to happen," said an analyst. Golay is due to be released from jail on Friday after serving a year's term following his conviction in a corruption case. Golay was found guilty of misappropriating funds to the tune of Rs. 9.50 lakh in the milch cow distribution scheme of the Sikkim government when he was the animal husbandry minister in Chamling's first term as chief minister between 1994 and 1999. The SKM, on its part, is making elaborate arrangements to welcome Golay, who had given Chamling a real scare in the Assembly elections in 2014. The party has been mobilising its supporters and plans to bring as many of them to Gangtok on the day of its president's release. The frontal organisations of the party have been holding daily media briefings here for the past few days to keep the hype going. Thapa alleged that that the SKM was planning to get people from outside to soar up its strength. SKM press and publicity secretary Bikash Basnet, however, sought to rubbish the charge. Three days before P. S. Golay, the president of the Sikkim Krantikari Morcha, is due to be released from jail, the ruling Sikkim Democratic Front held a massive show of strength by organising an umbrella - the party's symbol -rally here on Tuesday.